We all see Police using breathalyzers on drivers to check if they are under the influence of alcohol. Drink & driving is a crime in all countries. But do you know that this machine is easy to make? Here is how to DIY alcohol breathalyzer with 3 digit display output. This article is about a breathalyzer circuit using 8051 microcontroller which outputs the blood alcohol content (BAC) from the breath. The BAC is displayed in percentage on a 3 digit seven segment display. The microcontroller used if AT89S51 which belongs to the 8051 family and the alcohol sensor is MQ135 gas sensor from Futurelec. MQ135 is a stable and sensitive gas sensor which can detect ammonia, carbon dioxide, alcohol, smoke, nitrogen dioxide etc. The sensor consists of a tin dioxide sensitive layer inside aluminium oxide microtubes, measuring electrode and a heating element inside a tubular aluminium casing. The front end of the sensor is covered using a stainless steel net and the rear side holds the connection terminals. The ethyl alcohol present in the breath is oxidized into acetic acid while passing over the heating element. This ethyl alcohol falls on the tin dioxide sensing layer and as a result, its resistance decreases. This resistance variation is converted into a suitable voltage variation using an external load resistor. The typical connection arrangement of an MQ135 alcohol sensor is shown below. MQ135 has different resistance values at different temperature and different concentration of gases. The manufacturer recommends calibrating the sensor at 100ppm of ammonia or 50ppm of alcohol. The recommended value of the load resistor is between 10K to 47K. The voltage output of the alcohol detector unit is converted into a digital format using the ADC0804 (IC1). The Vref/2 pin of the ADC is held at 1.28V using the voltage divider network made of R14 and R15. Vref/2 =1.28V means the step size of the ADC will be 10mV and the output of the ADC will increment by one bit for every 10mV increment in the analog input. Refer the datasheet of ADC0804 for a better grasp. Digital out of the ADC (D0 to D7) Â is interfaced to Port1 of the microcontroller. Control signals CS, RD, WR, INTR are obtained from the microcontrollers P3.7, P3.6, P3.5, P3.4 pins respectively. R9 and C1 are associated with the clock circuitry of the ADC0804. Capacitor C3 connected between Vin+ and Vin- of the ADC0804 filters of noise (if any) in the sensor output. If C3 is not used the digital output of the ADC will not be stable. This filter capacitor will surely induce some lag in the ADC response but it is not very relevant in this entry-level application. The microcontroller performs required manipulations on the ADC digital output in order to convert it into BAC % and displays it on the three digit seven segment display. Port0 of the microcontroller is interfaced to the multiplexed three digit seven segment display. The drive signals for the threes digits are obtained from the microcontroller’s P3.0, P3.1, P3.2 pins respectively. The MQ135 gas sensor requires around 5 minutes of preheating before the first use. The MQ135 takes few minutes to retrace back to its normal condition after a positive test (alcohol present in the breath). If there is no alcohol in the breath, the sensor output will swing back to its normal condition very fast. Read these articles Interfacing seven segment display to 8051 microcontroller , Interfacing ADC to 8051 microcontrollerÂ before attempting this project. This breathalyzer circuit is just an entry level one and is not suitable for high-end applications such as law enforcement or laboratory application. The logic for converting the digital output of ADC into BAC percentage was obtained using approximation techniques. Why am I not later than seven segment too. 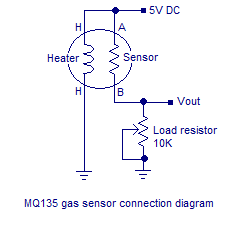 sir plz tell me can i use MQ 2 gas sensor instead of MQ135 ? Iwould like to put this project for college project exibtion ..wiill u giv me infomatin of components from where to buy..?? Very good for learners and old who has nobody to teach and Explain. Let the goddess of learning bless the installers of these series. MQ135 gas sensor…. where to buy??? suggest online shopping website ..
All the best with your adventure 🙂 Go ahead and let us know! how to convert these program in c language. or can u give me the program for c language? plz plz plz plz reply me. thank q.